THE END of the year mayhem has started in earnest. Know how I know? Because I am baking cupcakes. It seems that any kind of after-school activity must have its own year-end celebration, complete with baked goods. Kinderkick had a ceremonial presentation of certificates. Ditto for Little League. In the past, I have attended year-end ceremonies for Girl Scouts, karate, and swimming lessons. My children have "graduated" from preschool, kindergarten, fifth grade, and eighth grade. Nowadays, "graduations" mark every blessed event no matter how casually our children meander through the endeavor. Not only do I feel like all this ceremony is a little mawkish (tiny mortar boards for 4-year-olds, anyone? ), but these myriad mini-rituals drain the real celebrations of any meaning whatsoever. I don't know about you, but my parents expected me to graduate from fifth grade, not to mention eighth. I remember my daughter and her friends musing on what they would be "getting" for graduation. From fifth grade! Now I knew, like any good guilt-ridden parent, my daughter would be materially rewarded for her somewhat lackadaisically earned certificate from elementary school (her jets turned on later). I also knew this would involve jewelry. Her class celebrated with T-shirts, a class trip, a class DVD with the production values of a James Cameron premiere, and a year-end assembly with digital cameras clicking and a phalanx of fathers lining the walls taping the entire thing. In addition to the hype, all this yearly stocktaking inevitably fills my kids with unreasonable feelings of loss. "I loved violin and now it's over!" wailed my inconsolable son after the final party (well, at least until next year). This, from a child who would have rather set himself on fire than practice and who had a suspicious Thursday afternoon stomachache all spring. The big year-end parties, the buzzing parent-filled "graduations," the final class picnics all conspire to make the onslaught of summer feel like a vast void when all that other stuff is over. "Forever!" say my kids slumped in the back seat. I fear that our children will wonder where their congratulatory pre printed certificate is when they get their first job. Who will feed them cupcakes when they finish painting their apartment? Having a childhood spent watching adults tick off every tiny step forward with equal reverence is a dangerous business. It sets up kids to see everything as equally important. And when everything is important, nothing is important. My daughter is actually facing a graduation worth celebrating. Her high school days are dwindling, now countable on one hand. Her college acceptance letter is on the fridge. For a long time, I was eerily inert about this milestone. I know it was because I was equating it with another cupcake ceremony. I got slapped back into reality in the department store dressing room watching her model graduation dresses. My daughter has been trying on her adulthood for size all year, but I almost missed it. So let's make sure we don't lump our children's year-end accomplishments into an amorphous pat on the back. We need to make sure that we are ready to cheer, clap, and cry when it really matters. No cupcakes required. Allison Ijams Sargent is a freelance writer. 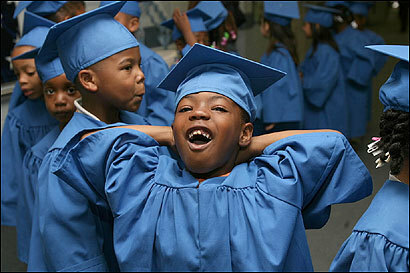 Do you think kids today have too many graduations and year-end celebrations?